How stinkin cute is this? The BandaBibs from Bazzle Baby have me itching to pull them up over my sons mouth and say "this is a stick up". I am not a big fan of bibs and I have the stained baby clothing to prove it. However, BandaBibs are far from your ordinary bib. Not only do the funky & retro patterns combined with the bandana style make me love how cool they look on my child but the unique design does an excellent job of keeping mess off your child. BandbaBibs fit closer & higher on the neck than the average bib and it gives baby more coverage in the area that drool & food usually falls. 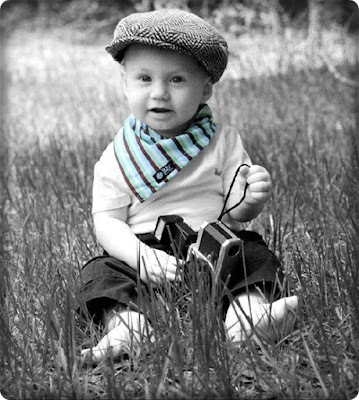 Bazzle Baby has a great collection of stylish items for your baby from paci clips to burp cloths. 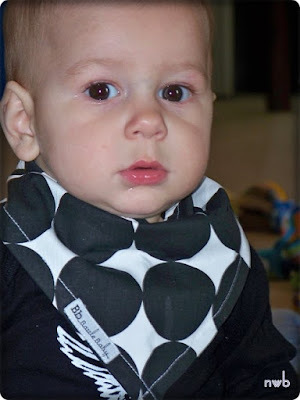 Prefer the traditional style of a bib but want the adorable prints available at Bazzle Baby? You are in luck because they also offer traditional bibs in sizes just right for a toddler or for your newborn. You can win a BandaBib in your favorite print! To enter to win visit Bazzle Baby and comment back telling us your what is your favorite BandaBib (this is the one you will get should you win). The deadline to enter is May 1st at midnight EST. You can double your chances by subscribing to Now What Baby. Already a subscriber? Just remind us in your comment to score your extra entry! I adore them all but I would chose the preppy girl bandabib. My favorite is the cow bandabib. LOVE LOVE LOVE the preppy boy argyle pattern! I love the Sweet Pea Bandabib. Thanks! Love the cute Nautical Bandabib! The Preppy Boy Bandabib is adorable!